We had been communing with local and national Native brothers and sisters for weeks before Chief Arvol Looking Horse’s arrival our 35th Anniversary on Saturday, October 7th, for Agape’s 35th Anniversary when he began his prayerful, meditative morning reflection, standing in headdress and purple shirt. I was enveloped then and still rest in a sacred spirit, a surge of energy, both in time and timeless, as I attempt to grasp Chief Arvol’s presence and the entire day of Listening to Native Voices: Standing Rock is Everywhere. My heart is full, my being awake, present to mystical vibrations of the day with me now, two months later. 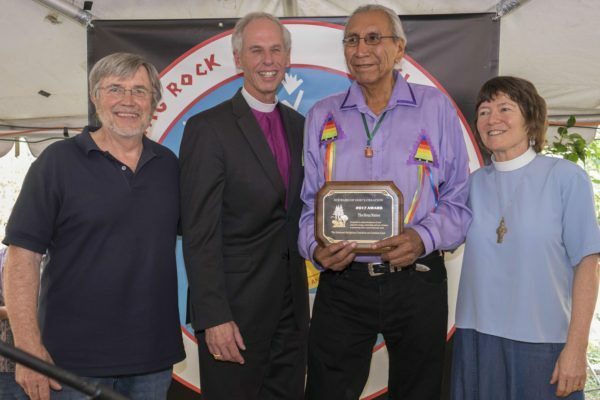 Accompanying Chief Arvol as he walked the consecrated grounds of Agape, I felt a sense of ease in his gentle, towering dignity as we sat near each other as participants streamed up the Agape driveway with the sound of native drums greeting them. Being a companion for the day to Chief Arvol, I was walking in a terrain unknown to me–communion with a revered Native elder, from stolen ancestral lands, steeped in native blood. For a week leading up to Chief Arvol’s arrival, we at the community had learned about tobacco ceremony, traditional greetings, sage smudgings, as we rehearsed water ceremony prayer at dawn and heard Grandmother Moon teachings, with our native friends Beatrice Menase Kwe Jackson and Peggy McNew. A holy awakening, like a warm breeze, envelopes all who watch as Rock, a local native, in ceremonial garb, tends the sacred fire. 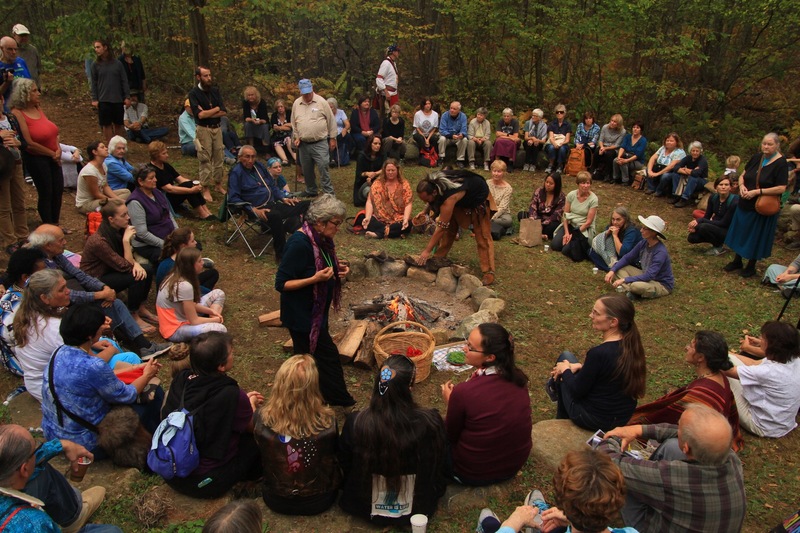 Several hundred people, led to the Agape pond by Bea and Peggy, return from the water ceremony, to sit on the ground, on rocks and tree stumps. Chief Arvol is our center. We maintain nearly total silence. The trees, breeze and autumn day, unseen creatures witness our stillness. Chief Arvol, his iconic face, a portrait of Sioux lineage and nobility, sits with us, now dressed in black shirt and slacks, a pendant around his neck. I experience those of us in the circle drinking in the holiness of this moment. Frozen in reverent silence, we form concentric circles around the fire and Chief Arvol who stares prayerfully into the fire, with an expression of sadness and resolve. Suddenly, unexpectedly, Arvol rises from his chair, his six feet, six-inch presence, humble, unpretentious. We feel the stirring within us as one heartbeat. Strangers share solemn glances, feeling the intimacy of the moment, held together by an Unseen Spirit. Chief Arvol speaks of “healing that comes from listening.” His voice at times, barely audible he tells us not to drink alcohol or to eat foods that violate the balance of life. 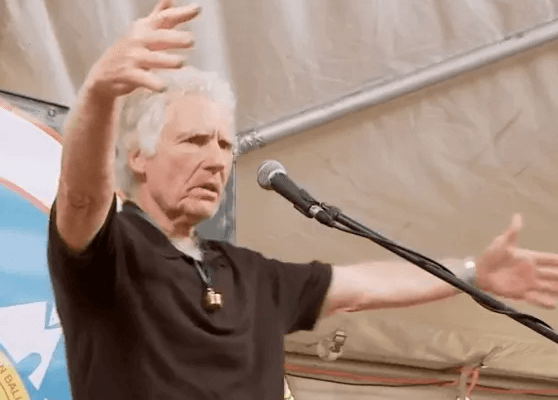 “We do not use marijuana,” he tells the rapt crowd. Slow speaking, with no desire to rush or to please, Chief Arvol creates among us an atmosphere of an outdoor temple. We listen, some of us with heads bowed, to his every word. The next day, with a profound spirit of peace still emanates from the land, mysterious and calming. Arvol had requested a 4 am wake-up, with breakfast and early departure to JFK with Brayton. After breakfast with Elena Creef, a good friend of Arvol and a professor at Wellesley College, we each grab a flashlight and depart from Brigid House. In the distance, we see darkened figures at the fire. Drawing nearer, we spot Ryan, a friend from New Jersey, who, at Beatrice Menase Kwe’s request, had tended the sacred fire throughout the night. Chief Arvol says yes to our request that he offer a prayer. We proceed to the fire for a final farewell. Butterfly Woman (Charleen) and Gentle Hawk (John) who had stayed overnight in their tepee quietly, reverentially join us. Oh sacred fire, where yesterday, hundreds sat in transfixed surrender before you, breath holding breath, and, at the center, your love rising. Tobacco still smolders. 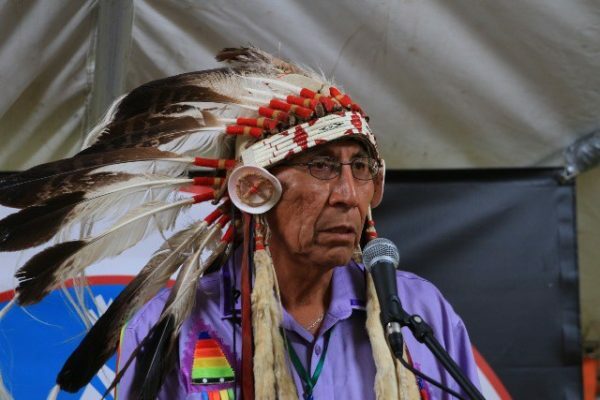 Chief Arvol speaks: “I would like to chant a Lakota prayer.” In a voice pure and radiant, Chief Arvol Looking Horse sends out the spirit of the Sioux nation in a Lakota prayer I do not understand. I feel the gentle lift of his words, a blessing on this Nipmuc land. The 19th Keeper of the White Buffalo Pipe addresses The Great Spirit, (Wakan Tanka), and the words half-spoken, half-sung, will forever mark the leaves, the trees, the rocks, the fire where they fell. He cel tohanl, nitokab woyasu ki el, wahinajin ki, ima ya cu kta. That I may be accepted in thy sight and judgement.